In May 2010, when he was in the third grade, Aaron Laws started blacking out. At first, it appeared Aaron suffered from heat stroke, but then blacking out turned into seizures and uncontrollable fits involving only the left side of his body. After lots of testing, his neurologist found a tumor on his brain called an oligodendroglioma, a cancer involving one of the types of cells that make up the supportive tissue of the brain. To Aaron and his family, “the 17-letter O word” was a shock, said Karen Laws, Aaron’s mom. 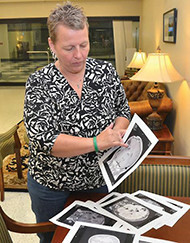 That type of brain tumor is very rare, appearing in 4 percent of all brain tumors, and almost all of those are in adults over 50, according to the American Brain Tumor Association. Aaron had five surgeries and received specialized radiation in Florida over the course of a year and was finally tumor-free. Then, this past June, doctors told Aaron, now 14, that they had found three new growths on his brain. But it has not slowed Aaron down at all. 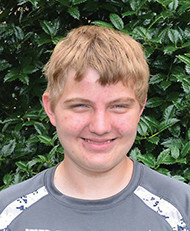 In the last two and a half month, Aaron has hiked 85 miles in New Mexico with his Boy Scouts troop, attended scuba camp, worked on becoming an Eagle Scout and started his freshman year at the Caldwell Early College High School. Having just returned from his trip to New Mexico, Aaron rubbed his eyes and wearily blinked. “It was fun. I’m tired now, though,” Aaron said. Each day, the Boy Scouts hiked three or four miles a day with a 50-pound backpack. One day, they hiked 11 miles. When they were not hiking, Aaron said, the boys learned to throw tomahawks, shoot and helped build a railroad with ties and spikes. Now that he is back in Caldwell County, Aaron has started working on his Eagle Scout project. He wants to build a bookshelf and fill it with children’s books for kids at either Robin’s Nest Child Advocacy Center or the Shelter Home of Caldwell County. He has already started collecting books for the project. Aaron himself is quiet and does not want to talk about new tumors appearing on his MRIs. It reminds him too much of what he went through before. “I’m scared because I’m probably going to (have to) do the same thing again,” Aaron said. However, Aaron has a system of support from his community and family. “Aaron has a reason for all of this going on. There’s a reason. We’re in it for whatever it takes,” Laws said. "We’ve gotten to do lots of things these past five years. We're blessed."